Snowflakes are a classic craft to make with kids in the winter months, especially if you live in an area that doesn’t get much snow. 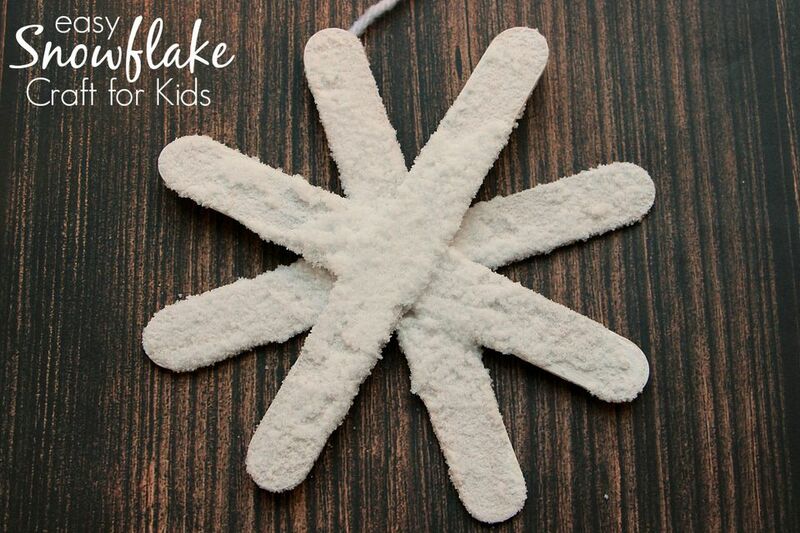 This snowflake craft is easy to make and your kids will love the unique snow-like look that the salt gives them. To start this craft you want to paint your craft sticks with white paint. Any type of paint will work. I’ve found that acrylic paint tends to dry faster than tempera paint but the both work well. Next, glue your snowflake together by putting a bit of glue in the center on one craft stick and then layer another craft stick across the top to make an “X” shape. Repeat the process of overlapping craft sticks until you have your snowflake. We used hot glue because it dries in a matter of seconds but white glue works too. If you use white glue make sure you give it time to dry. Next, you want to cover your craft sticks in glue. Simply brush glue on with a paintbrush. Pour some salt into a shallow tray. Flip your glue covered snowflakes over and place glue side down into the salt. Rotate around until all the glue is covered with salt. Shake off excess. Lay your snowflake on a flat surface until the glue is dry. We added some string to the back and hung in our windows. Each of these turned out different, just like real snowflakes!